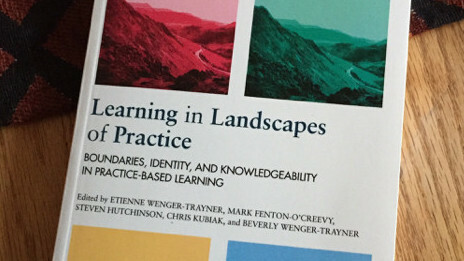 Our new book on “Learning in Landscapes of Practice” was published by Routledge in July. For us, the book is a significant milestone both theoretically and practically. We focus on landscapes of practice, rather than single communities or networks as a key locus of social learning capability. We introduce the concept of knowledgeability as an outcome of learning with respect to a landscape, which includes a lot of practices in which one cannot claim competence. Theoretically knowledgeability is a landscape-level counterpart to the concept of competence, which is defined at the level of communities of practice. These are significant developments, whose full implications we are now exploring in our current writing. We discuss key dimensions of the role: its challenges, the traits of people who do this, and what a social learning approach looks like. We co-author two case studies of ambitious systems convening projects. In addition to our chapters, our co-authors use stories to explore various aspects of living a landscape of practice, including the emotional and political dimensions of boundary crossing, brokering, multimembership, and visiting practices along one’s journey. Wonder how these developments resonate with you? we call this PBL in our line of working where theories are proven by working with certain goals within the daily routines, the students are given some persons whom they have to aid in their daily routines and assist them further by looking at some problems which may accur while working with them or problems which already are obvious and the reason why these persons already live in nursing homes. As there is a growing population of elderly persons we have to develop new ideas on how they can cope with certain problems in the future. The students can assist these elderly persons via the goals of their education programe and the theories from their books by working out a PBL -problem based learning and hopefully give the elderly persons an idea of how to cope which mainly also is the foundations of rehabilitation which will be the future in assisting the handicaped and elderly persons along with different kinds of robots. Buenas noches doctor Etienne, estoy muy contenta con la información y conocimiento sobre la teoria social del aprendizaje y las comunidades de práctica.De hecho actualmente estoy adelantando mi tesis de maestría en psicologia en la universidad del valle en Colombia. Me gustaría saber si usted ha tenido experiencia con la identificación de estos elementos en grupos de trabajo como predictores del surgimiento de una CP. Agradezco cualquier orientación o guía que pueda brindarme. In analyzing a “complex landscape”, would you be referring specifically to the political, local nature, and diversity of that particular environment? I am interested in applying this to my own contextual background for a current study. Could you please advise? Yes, definitely. Learning capability very much depends on the local politics and diversity of the landscape. Muchas gracias por facilitar los conocimientos de CoP, en este espacio…por favor necesito saber si el libro puedo descargar en formato digital, o solamente esta en físico…(traduccion en español??). Para comprar por dónde¿?. A kindle version of the book is available on amazon, but there is no Spanish translation to date. My research interest is about knowledge brokering and I am interested to know if there has been any further thinking about the idea of knowledge brokers. Your original thinking was that brokers should be on the periphery of the relationship they are brokering. I am trying to argue that within certain communities of practice there is scope for internal brokers to operate. What do you think?